Think you could catch more fish if you had a boat? Daniel Nielsen dives into fishing tutorials from the shore. Might make you think again who has the advantage. Daniel makes the shoreline fisherman think twice before randomly selecting any lure. 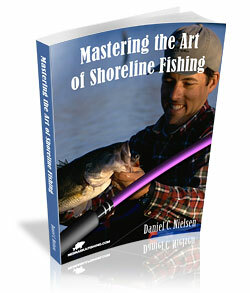 Learn how to pick the best lure, tie better knots, and catch just about any fish from the shore. Lets take another look at the boat anglers for a moment. The obvious reason for boat anglers success rates hasn't eluded me. Mobility is their main ace in the hole. The boat anglers take advantage of their mobility in ways that shore fishermen can't. They can, through this mobility , utilize presentation methods that enhance their catch rate. Trolling, slipping, anchoring or drifting are just some of the methods they can employ. Position is mobility in its most precise sense. It is also paramount to their success. Its therefore no different for the shore angler, although the options for shore fishermen are fewer. Unless there is current present, drifting over an area can only be accomplished through wind aided slip float presentations. Precision casting, be it with bait or artificial lure, is critical. Varying retrieve methods are also a must have for the shore angler. One thing I have learned over the years form fishing on shore is that versatility is, always has been and always will be, paramount to an anglers success. This book has some pretty good tips. How can I get in touch with the author if I have some questions? Hi Frank, thanks for posting the question! I tried to email you but it was a bogus email address (I hate spam too)! I added the table of contents to the page. Let me know if you would like more. - As a photographer, its hard to give up the cootrnl of the camera, hand it to someone else, AND be in the photo I am so happy I did. The pictures are outstanding!You are a wonderful photographer, Jenna.Beauty and humor, they have it all. Thank you.